During the dark days of war and constant political turmoil it seemed at times the world had truly turned upside down. Bad became good, wrong was suddenly right and crime paid. Perhaps the ancient scriptures were correct in predicting Kali Yug, the age of demons, when ‘sin increases exponentially and virtue ceases to flourish’. 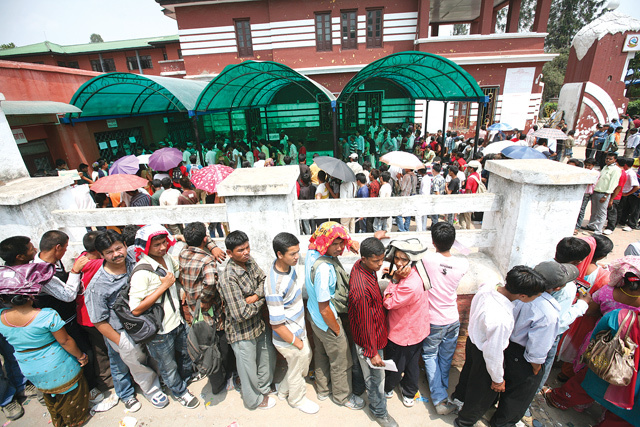 Despite the fact that over 1,500 Nepalis leave the country each day in search of work, our leaders rarely mention the economy, much less discuss ways to improve it. This was painfully obvious during the 2013 election campaign when the subject of creating jobs for the growing population never once came up. At the risk of stating the obvious, there is no other democracy on earth where politicians could get away with blatantly ignoring what voters care most about. The Hand relies on comparison to avoid getting lulled into thinking what happens here is normal. In most democratic countries elections are won or lost on the economy and the candidate’s perceived ability to create jobs. When unemployment in America dropped to 7.9 per cent during the last election campaign, for example, it allowed the Democrats to brag about ‘jobless rate below 8 per cent’, which helped Obama get re-elected. Imagine that: they have percentile points in their statistics while we don’t even have ball-park figures. For some strange reason no one ever asks our politicians about Nepal’s unemployment rate or how to improve the moribund economy. If a competition was held to see which party created more jobs in the past decade they’d all come in last. A closer look, in fact, reveals that each of the parties actively contributed to job losses while in power (or opposition) through obstructionist policies, greed, predatory tax departments and sheer incompetence. In the national race to the bottom all are guilty of retarding the nation’s growth and robbing the young of their future, though some more so than others. In an unprecedented development, the recent budget promised to create 50,000 new jobs in post-earthquake reconstruction, a welcome initiative that took a natural disaster to produce. Considering the government has already forgotten the quake victims it’s anybody’s guess whether these jobs will actually materialise. Maoist opposition leader Baburam Bhattarai weighed in saying 500,000 new jobs were needed, though he never said anything similar when he was PM. Nonetheless, no other party has spent so much time and effort in training and teaching new skills to thousands of young Nepalis. Unfortunately, the Maoists taught them all the wrong things: armed combat, bomb-making, kidnapping, torture and the finer points of extortion. Many youth left school to join the cause, and now that they’ve been discarded by the party, their lack of skills (apart from the above-mentioned) makes them basically un-employable (except by criminal gangs). In the upside down world of Naya Nepal where bad is good, perhaps we should start honouring the worst (= best) among us. Since we can’t applaud any party for creating jobs let’s recognise those who destroy them. While Congress and the UML wasted the last 20 years in typical short-sighted idiocy, looting the treasury when in power or blocking all progress when in opposition, the damage they inflicted on the economy was serious but not terminal. Leave that to the Maoists, who were responsible for more unemployment-creation than all the others combined and the only party far-sighted enough to plan long term job losses well into the future. There are few better ways to wreck a country’s prospects and ensure enduring joblessness than launching a civil war. When the war began in 1996 Nepal was enjoying its strongest economic growth in history, reaping the benefits of an unprecedented liberalisation of the economy. Manufacturing increased and exports of carpets, garments and handicrafts boomed. Some say the fear that prosperity and a growing middle class would undermine their cause led the Maoists to attack the state when they did. Those with decent jobs and a future have no time for revolution. To ensure such jobs disappear, Maoist- affiliated unions sprang out of nowhere and forcibly took over factories, hotels and other places of employment. Needless to say, their militant tactics backfired (or succeeded?) and many businesses shut down, leaving more disgruntled workers to manipulate and use, which suited the party just fine. When the war had served its primary purpose of gaining the Maoist leadership fabulous wealth, the party used the CA and mindless obstruction of the constitution to keep the country unstable and ensure prosperity (for others) remains a distant dream. Don’t forget: prosperous societies don’t need Maoists. To be fair, most of our politicians have never had to earn a living so why should they worry about jobs? Perhaps they feel they’ve already done their part to reduce unemployment by hiring all their relatives or maybe they’re simply realists, who see Nepal’s unemployable youth as dispensable, good for nothing except demonstrating and rioting. After all, that’s the only skill-set our leaders ever bothered teaching them.